While Beats announced three new wireless headphones equipped with Apple's new W1 wireless chip earlier today, it also quietly released the new Beats EP wired headphones with a 3.5mm headphone plug. The new on-ear headphones are built to deliver "premium" sound in a "tough" and lightweight frame. The headphones are battery-free, allowing unlimited playback with a hassle-free fixed cable. They also come with adjustable vertical sliders so that users can personalize the fit for their head. RemoteTalk control allows users with iOS devices to take calls and control their music. 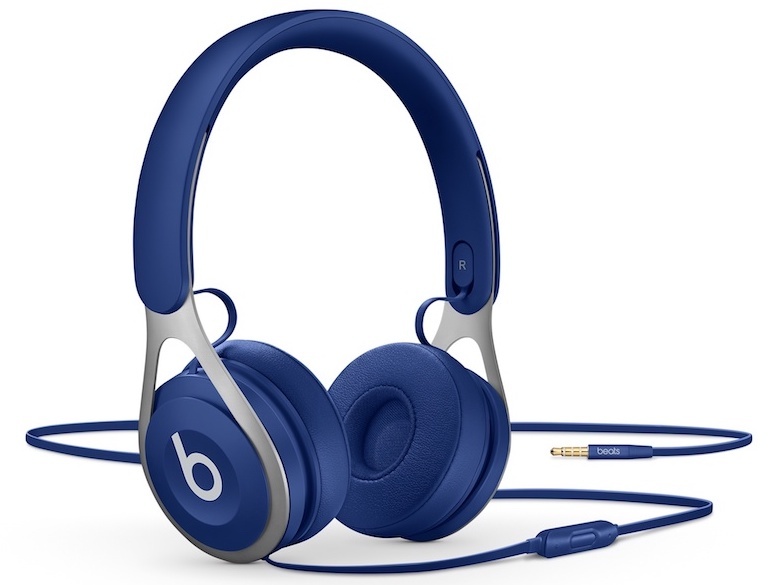 The Beats EP are available in four colors (blue, white, black, and red) and is available now on Apple.com and select retailers for $129. The headphones are battery-free, allowing unlimited playback with a hassle-free fixed cable. They also come with adjustable vertical sliders so that userscan personalize the fit for their head. Did Dre not get the courage memo? The headphones are battery-free, allowing unlimited playback with a hassle-free fixed cable. I laughed. It sounds like an Apple Keynote in a few years if they brought back the 3.5mm headphone jack as a new "innovation!" "No pairing, no batteries, just a plug and play music experience"
At least I can use my free provided adapter from Apple. instead of a lighting version. There's a real special kind of dumb going on here. Beats probably sells over half of its headphones to folks using Android. And percentage might be up to 75%. The Android phones use jacks. They will continue to service that market for years to come. Seems like they would have bundled a lighting cable as well. I would think this is an ironic moment for Beats to release a headphone with 3.5 mm jack. Anyway, I don't have the budget to buy not-good-sound-quality beats headphone. They looks pretty cool though, especially the blue color. Just find a site with all emojis, uh, you mean emojis in iOS? Well, tapatalk has a way to support it. The most confounding part is that this 3.5mm cable is FIXED and not detachable. If it were detachable I'd say this all fits fine with the plan ... But this is just head scratching. And where is the 3.5mm (source) to Lightning (headphone) adaptor? I kept shaking my head during the keynote, then went online to check things out. No way to use your new Lightning headphones with your old Apple gear like iPods and Macs, or anything else, all but guaranteeing that a customer needs to carry two sets of headphones with them! They're bundling Lightning headphones AND a 3.5mm adapter, so why not just bundle the old 3.5mm headphones with the 3.5mm adapter? At least that way a customer only needs one set of headphones, and an adapter to use them with the iPhone. I guess existing iPhone customers can just use their old earbuds with the new adapter which just seems to defeat the purpose. I'm all for lightning headphones, but this seems like a half-baked roll-out. I hope to see Lightning ports added to the Macs at an event in October, but even then, it doesn't address legacy Macs. And where are the adapters? Heck I would take a Lightning to USB-C adapter even, but they would also need USB-A. So why not just a much simpler and cheaper 3.5mm adapter with an analogue passthrough chip, which could be used on all current Apple products? Seriously where's the support for this transition?